LED Strip Light Voltage Drop, What is Voltage Drop? LED Strip Light Voltage Drop: What is LED voltage drop and how to fix it. One of the most important things to consider when installing LED Strip lights is the effect of what is called “Voltage Drop”. In DC circuits, voltage gradually drops as it travels along through a length of wire (or an LED strip light). So, with every foot of wire, the available voltage to each foot gradually decreases along the length of wire. This can lead to having one end of your strip lights being brighter than the other end. There are a few things you can do to avoid voltage drop in some situations. The amount of voltage drop will vary based on the brand and power consumption of the LED strip lights. 12V LED strips will lose voltage faster than 24V strip lights, so if you are looking it make longer runs over 40 feet, we would recommend going with 24V strips. To prevent voltage drop: Divide long runs of LED strip lights into shorter strips, then connect additional “Parallel” wires from the power supply to each new LED strip. This process can be repeated as many times as needed. You may also run additional wire from the power unit alongside the uncut LED strip and attach it when voltage drop starts to occur. Just make sure you are using the correct wire gauge as explained below. If you wish to install a continuous run of over 90 feet of ColorBright™ LED strip lights (12VDC 2.9w/ft), and/or are using an even longer length of wire from the power supply to the strip, use a “Parallel” connection. If you needed 60 feet LED strip lighting in the left / right side of a bar or patio (or whatever), we recommend installing the power supply in the middle of the run and having one 30ft section running from the power supply to the left, and one 30ft section going to the right. Again, this is called a “Parallel” connection. 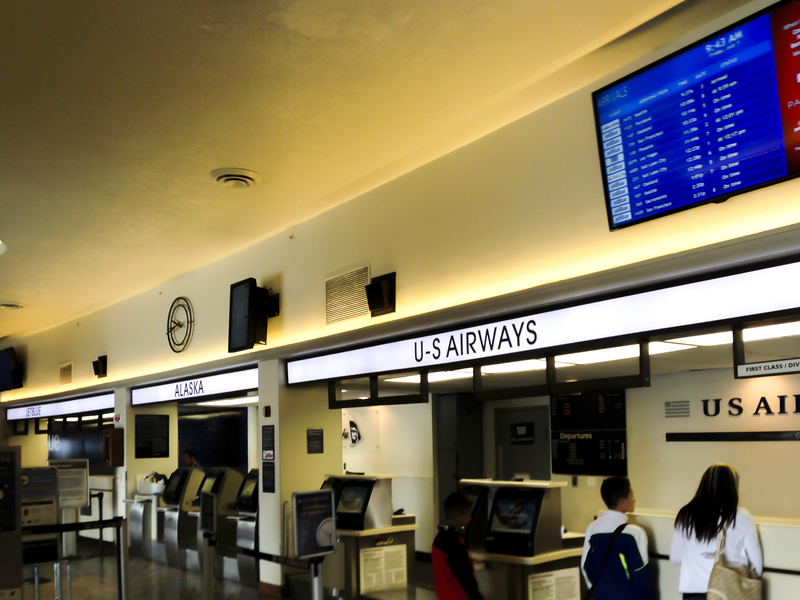 The Long Beach Airport installed a 60 foot long run of our LED strip lights This example used (2) 30ft runs of our 24V Architectural Warm White LED strip light. They did not want to install the power supply in the middle and run the lights in opposite directions (above in Example 2), so they opted to install a power unit on the opposite ends of the 30 foot runs to create a 60 foot run with no voltage drop. The strip is not connected in the middle and you can see there is no visible dimming of light (voltage drop). 1. Calculate the total length of wire from the power supply to the LED strip. 3. Divide the total wattage of your strips by 12 (if using 12 volt strips) to get the total current (amps). If you are using 24 volt strips, divide by 24. Now you have the current (amps). 4. The correct wire gauge is found in the intersection of amps and feet as seen in the chart below. Note: The wire itself draws current. If you are running longer lengths of wire than the total length of strips, use the next thickest wire. On the AWG scale, a LOWER number indicates a THICKER wire. It’s never a good idea to continuously run any electronic circuit at maximum capacity. For best results, add an additional 20% margin to your calculations. For example, if your total power consumption is 100 watts, add 20% (watts x 1.2) and assume it’s 120 watts. Then continue to perform your calculations for power supplies and wire gauges. This will protect your system to make it last longer and operate more safely. NOTE: This also applies to single color led strips in which you have installed a dimmer after the power unit and before the lights. RGB color changing strip lights have an extra step when considering "Voltage Drop". The 12v RGB strips we sell that have 150 LEDs on the reel can be run for two whole reels (32 feet) before experiencing a noticable voltage drop (4 reels in 24V). The 12v RGB strips that have 300 LEDs on the reel can only be ran for one whole reel before voltage drop is noticable (2 reels in 24V). The RGB controller is what makes the colors change. It basically sends out a signal to control the lights. When you need to run in parallel but want to control all the RGB lights at the same time with the same colors, you will need to transfer the signal from the first run to the second. An Amplifier is used when you need to transfer the signal from the first run to the second. Here is a great video that explains this in detail. Disclaimer: Please consult a professional electrician before doing any electrical work. This page is not to be used as professional advice, this is only a guide. Have questions or comments on an install?